Move over, Mauna Loa, there’s a volcano on Earth that’s even bigger than you. Scientists have confirmed the existence of a massive underwater volcano that could be the second largest in the solar system — one that even rivals Olympus Mons on Mars. Scientists have known about the geological phenomenon known as the Shatsky Rise for two decades, but they weren’t certain if it was a single volcano or part of a series of volcanoes. Now, as research conducted by the University of Houston’s William Sager and colleagues suggests, we now know that the massive, rounded, dome-like structure is indeed a mass of basalt that was formed by a single volcanic source near its center. The geologists were able to make this confirmation by analyzing core samples and data extracted from underwater explorations. They also looked at deep-penetration seismic scans taken from a survey ship. Called Tamu Massif, it’s located in the Pacific Ocean about 1,000 miles (1,600 km) off the east coast of Japan. The immense shield volcano encompasses an area about 120,000 square miles (310,799 square kilometers) — which is an area similar in size to the British Isles or the state of New Mexico. By comparison, Earth’s most active volcano, Hawaii’s Mauna Loa, takes up 2,000 square miles (5,180 square kilometers), making it 60 times smaller. It's worth noting that Tamu Massif is a shield volcano, and not a caldera like the one at Yellowstone National Park. 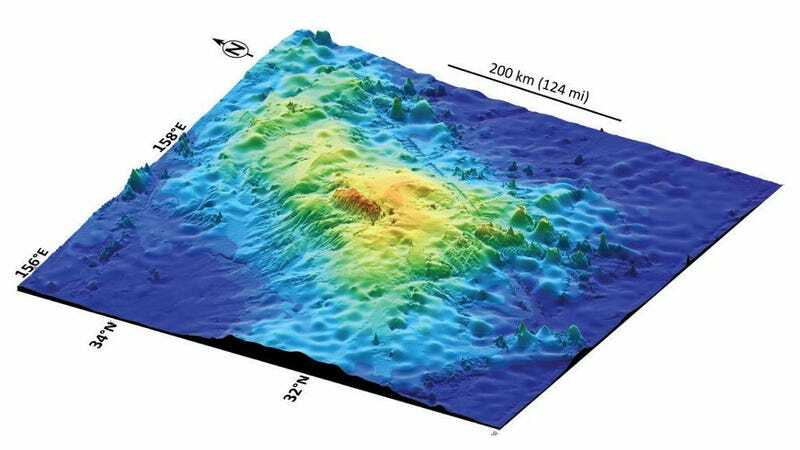 But unlike other Pacific volcanoes, the summit of Tamu Massif does not extend above the ocean surface. Its peak lies 6,500 feet (1980 meters) below the ocean top, and parts of its base lie as deep as four miles (6.4 km) down. In all, it’s about 2.5 miles (3.5 km) high and 18.6 miles (30 km) thick. The researchers say that its low and broad shape is the result of eruptive lava flows that traveled long distances. Sager speculates that an immense amount of magma must have come from its center, and that this magma originated from the Earth’s mantle. "It's not high, but very wide, so the flank slopes are very gradual," said Sager in a statement. "In fact, if you were standing on its flank, you would have trouble telling which way is downhill. We know that it is a single immense volcano constructed from massive lava flows that emanated from the center of the volcano to form a broad, shield-like shape. Before now, we didn't know this because oceanic plateaus are huge features hidden beneath the sea. They have found a good place to hide." The magma that was ejected was likely high density and very heavy, which pressed down the thin, weak oceanic crust onto which it erupted about 144 million years ago. Sager’s team is quite certain that Tamu Massif is now an inactive volcano. “We suggest that the Tamu Massif could be the largest single volcano on Earth and that it is comparable in size to the largest volcano in the Solar System, Olympus Mons on Mars,” note the researchers in their study. Olympus Mons is more than 12.4 miles (20 km) high, but its volume is only 25% larger that Tamu Massif’s. The Martian volcano also has relatively short roots, whereas Tamu Massif extends deep into the Earth’s crust. As for the name itself, Tamu Massif, it's not quite official yet. It still needs to be affirmed by the U.S. Board of Geographic Names — a process that could take up to a year. Top image: Integrated Ocean Drilling Program of Texas A&M University.